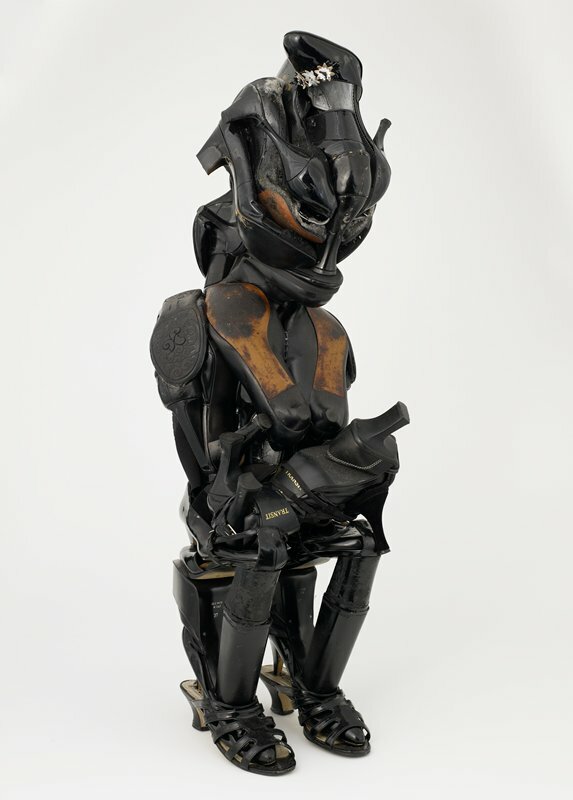 Influenced by African sculpture, Willie Cole constructed this piece of mother and child from a stockpile of discarded high-heeled shoes. Ann Klein with a Baby in Transit takes its name from the American fashion designer's label that appears inside two of the shoes. Cole has created similarly ironic artworks out of other used consumer objects, ranging from lawn jockeys and bicycle parts to salvaged irons and blow dryers. The rich, black color and well-worn surfaces of the footwear evoke the beautiful patina of many traditional African sculptures. When reassembled by Cole, these contemporary cast-offs become potent objects that appear to issue from another time and place.